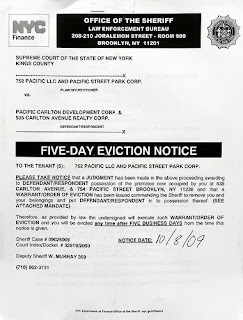 Well, Henry Weinstein got a five-day eviction notice from the Sheriff's Office evicting companies owned by Shaya Boymelgreen from a building and parking lots at the corner of Carlton Avenue and Pacific Streets. Remember, Boymelgreen tried to assign his lease to Forest City Ratner, but lost in court. Weinstein got possession of the property on September 18. Boymelgreen's willingness to assign the lease to FCR allowed the Empire State Development Corporation, likely using a map originally produced by the developer, to suggest that FCR owned or controlled some 5% more of the Atlantic Yards footprint than it actually did. A clarified ownership map was finally produced last month. 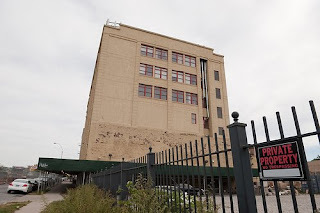 The property is destined for condemnation and interim surface parking should the project go forward.